This work restages a widely chirculated propaganda poster from the end of the Cultural Revolution by Xiao Shenya and Liu Enbin. 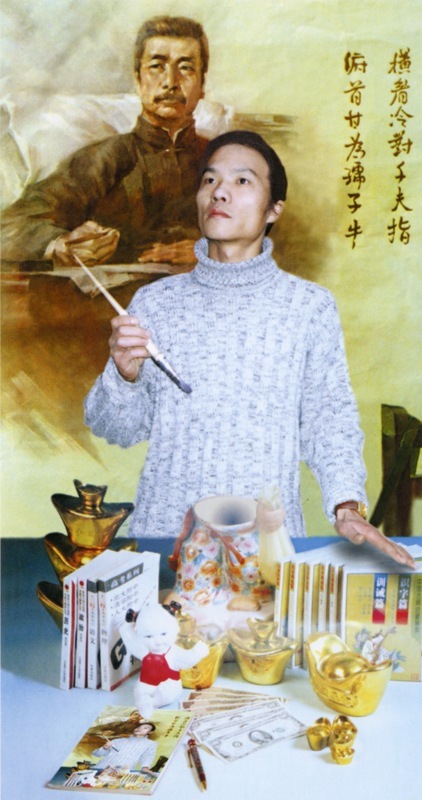 The artist Wang Qingsong replaces, in an identical pose, the female young pioneer (a member of the shaonian xianfeng dui) in the original work. A male entrepreneurial subject represents the new vanguard poised to compete on the international cultural market. His raised hand holds on oil brush, the tool that facilitated his entry into that market. While he remains caught in the middle ground of the picture plane, the future before him is no longer "poor and blank" but filled with cultural trappings of wealth. A portrait of Lu Xun and a couplet from one of his poems, details from the original, remain in the background. Wang Qingsong, Shenghuo lizan [Glorious life] (Beijing: self-published postcard set, 2001). The images on the website are copyrighted by other third parties, and are provided in this website to support research, teaching, and study. You may use any materials in this website on a fair use basis, in accordance with Title 17, Section 107 of U.S. copyright law. Other uses of these materials may require permission from the copyright holder. It is the user's responsibility to determine and/or clear any necessary rights.